Ralph F. Stolp, age 92, of Holland died Tuesday, November 13, 2018 at American House of Holland. Ralph lived his entire adult life in Holland, MI. Ralph graduated from Holland High School where he also played football and then went to Hope College and studied business. Ralph became a sales manager for Grand Rapids Motor Express and later a sales manager for Be-Mac Trucking Company. Ralph was a Petty Officer 2nd Class in the Navy during WWII where he was a radio operator. He was awarded medals for bravery and heroism. 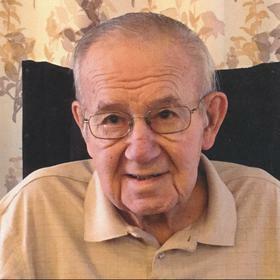 Ralph was a charter member of Peace Lutheran Church and involved in the Lions Club and Civil Air Patrol. Ralph enjoyed gardening, cooking, fishing, boating and making model boats. Ralph was preceded in death by his wife of 53 years, Phyllis, in 2001. He is survived by his daughters: Pam and Tom Bogus of West Olive and Linda and Richard Welch of West Olive; grandchildren: Mark Lam, Scott Bogus, Nicholas and Gerielle Bogus and great granddaughter Olive, Casey and Stephanie Bogus and great grandson Henry; sister: Marilyn VerBurg of Wyoming; nieces, nephews and cousins. A funeral service will be 11:00 am, Friday, November 16, 2018 at Dykstra Funeral Home – Northwood Chapel, 295 Douglas Avenue in Holland. Burial will be in Pilgrim Home Cemetery.